MAY BE REPRODUCED BY ANY MEANS ! is a method that is not only horrific but also barbaric. during this long three day process. to induce false labor, the horror begins. to pull this child out of the womb, "feet first" !! 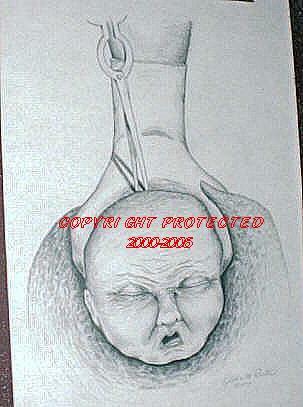 the babys' skull above the spinal cord. hanging, helpless and very alive baby ! to a very healthy baby !